I don't care what you traditionalists say... The dub is way better than subbed girly Goku voice. 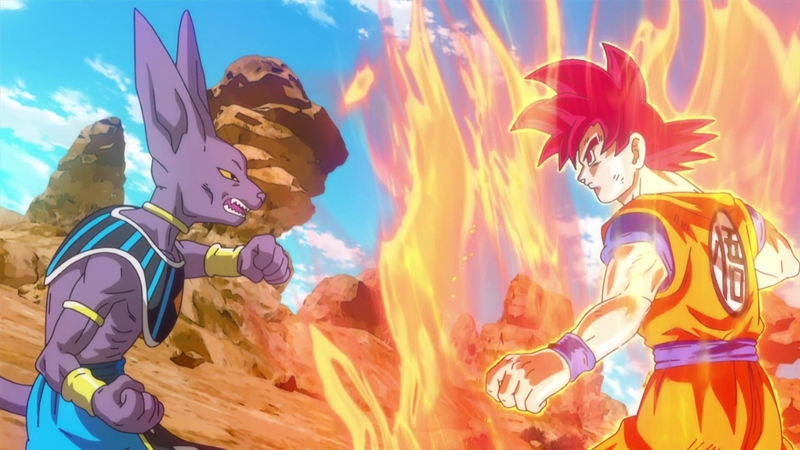 Goku vs. Purple Anubis Looking Thing. I'm pretty certain Goku wins. Unless they're planning to make Dragon Ball GT non-cannon. Still now I want to see Rule 63 of that Purple Anubis Looking Thing. I have a feeling that this movie was made to turn Goku into a god so that it'll restart the entire Goku vs. Superman debate. I actually looked up Goku's "God Mode" & it happens before he becomes extremely pink with a tail. So no, Goku still can't beat Superman. I also found Rule 63 of Bills / Beerus, but I can't show that due to breasts. So here's an image of him that at least made me laugh. Yep, original VA > dub. Fun flick. Final fight = disappointingly short. Won't watch again, coming from me who watched this on the big screen when it was screened here.